Flagstaff Black-on-white bowl. Click the image to open the Flagstaff Black-on-white gallery. 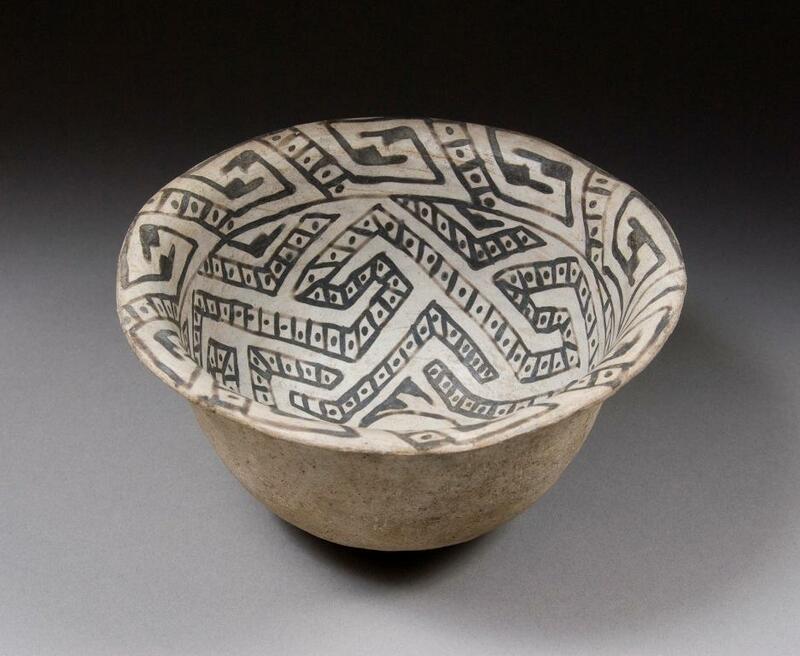 Flagstaff Black-on-white is a type of Tusayan White Ware found northeast of the San Francisco Mountains to and including the Hopi Reservation from Jeddito Trading Post west beyond Tuba City to Willow Springs, and on the Rainbow and Kaibito plateaus. Date Range: Kayenta Heartland: A.D. 1130-1230 (Christenson 1994), Flagstaff Region: A.D. 1140-1225 (per Christian Downum, Northern Arizona University). Temper: Abundant fine quartz sand, frequently almost invisible even with a hand lens; often conspicuous on unslipped surfaces. Surface Finish: Exterior bowl surfaces and interior jar surfaces are scraped, not polished; scraping marks conspicuous on exterior bowl surfaces; rarely very thinly white slipped; moderately well-polished; both slipped and unslipped surfaces frequently pitted; exterior surface of jars similar to interior surface of bowls. Surface Color: Exterior bowl and interior jar surfaces are light gray with bluish tint; interior bowl surfaces and exterior jar surfaces are white, sometimes with a light bluish tint. Forms: Bowls, jars, and ladles. Vessel Thickness: 2 to 6.4 mm (bowls). Design: Confined to bowl interiors, jar exteriors; bowl rims undecorated, except widely flaring forms; usually all-over patterns of stripes; straight wide lines; barbed lines usually in opposed pairs; pinnate lines, diagonal or rectangular cross-hatching, sometimes with dots in open squares; small solid triangles, sometimes with interlocking hooks; barbed and pinnate lines very frequent. Comparisons: Sosi Black-on white is usually bolder in treatment of design, stripes and lines are wider (average 6.7 mm), solid elements larger, barbs much less frequent, pinnate lines and cross-hatching absent; also frequently somewhat more highly polished. On Tusayan Black-on-white the design covers most of surface, producing a nearly open work effect; large solid masses are frequent; pinnate lines frequent, relatively less bold; decorated surfaces better smoothed, not gritty; undecorated surfaces well-smoothed, rarely pitted. Other Names: Tusayan Pottery, Black-on-white Ware, “Proto-Kayenta” Black-on-white, Tusayan Black-on-white, and 3rd Tusayan.